Sometimes, we're just too lazy to cook our own food and sometimes, we're too lazy to buy our own food. We have to buy the ingredients at the supermarket and make them and risk getting burns or cuts or we have to take the bus and spend some transport money to buy some food outside. In order to prevent those first world problems, we can order some pizza from our phones or our computers. 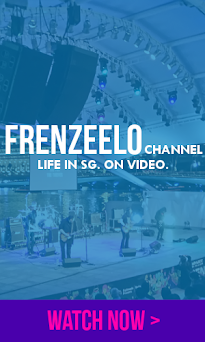 Pizza delivery existed so long ago since the 1980s and pizza delivery is the most popular delivery service in Singapore, if not, the world. My aunt decided to order some Pizza Hut for me when I visited her house. So, I have decided to use the opportunity to take some photos and do a write up of Pizza Hut's delivery. I love pizza and it's one of my favourite foods. My aunt ordered one of the combos available. The Pizza Hut combo that my aunt ordered came with Tortilla Chips and Cheese, 6 pieces Honey Roasted Wings, Garlic Bread, a regular sized Chicken Supreme Pizza and a big 1.5 litre bottle of Pepsi. One of the side orders was this. This was one of the newest side orders and I've never tried anything like this before (except tortilla that's on wraps) and it's quite unique. It's called the Tortilla Chips and Cheese. These chips were soggy and it didn't really taste that good. I'm not so sure if it was meant to be that way. Only one was crispy. Pieces of cheese were actually baked into the chips itself. In the picture, you can see some yellow spots and that's the cheese that has been baked into the chips. It comes with a small cup of cheese dip and the dip's nice to eat too. Especially when you dip the pizza crust in it. Overall, they're nothing special and I recommend you to get another side. Here's another side that came with the combo. As disgusting as that looks, it's actually really nice to eat. These were 6 pieces of Honey Roasted Wings. As the name suggests, it's actually pieces of chicken wings roasted with honey. Nice combination! 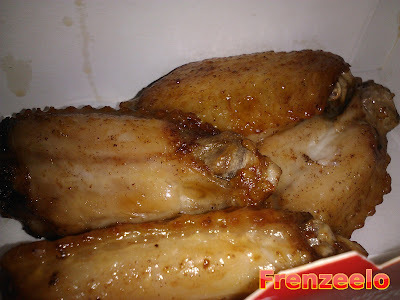 Most of the time with Pizza Hut Delivery, I always eat the Sweet 'N' Spicy drumlets. They're much better than these. The Honey Roasted Wings they serve contained lots of fatty skin and fats so I really recommend you to get the spicy drumlets. Otherwise, you can get these if you don't mind the skin or if you love chicken and honey, like me. 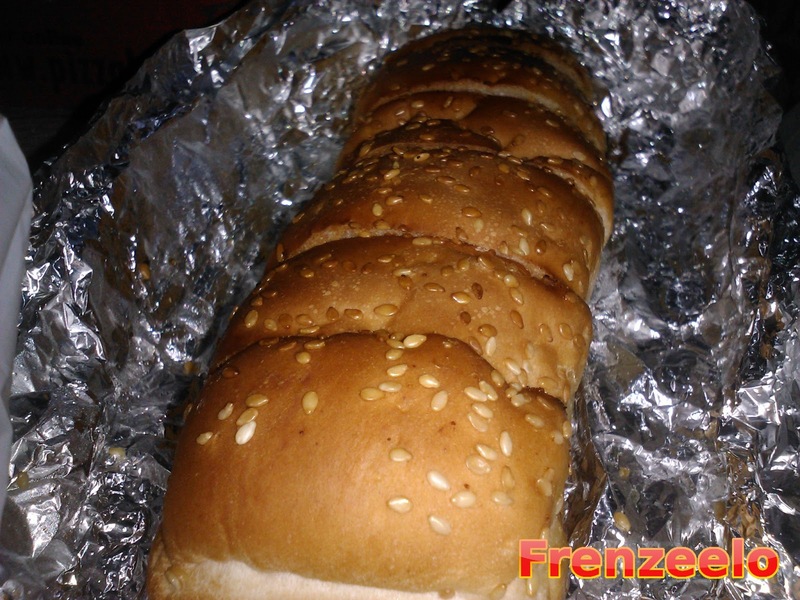 Another one of my favourite item in Pizza Hut is the Garlic Bread. 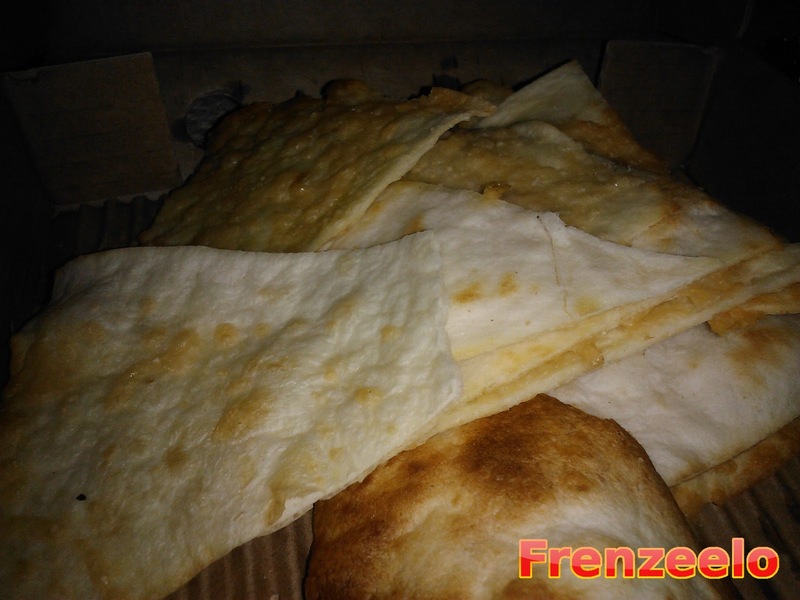 Pizza Hut's garlic bread is one of the best ever. The bread itself was light and fluffy, has some sesame seeds at the top and it's cut into a few slices. Just pick one up and you can see that creamy garlic butter that melts in your mouth when you bite into it. Pizza Hut's garlic bread is a must buy. Oddly, it's wrapped with aluminium foil. I wonder why actually. Can someone explain to me why Pizza Hut's garlic bread is always wrapped with foil? Let's get to the pizza itself. I wonder why Pizza Hut's pizza is like getting smaller. Each slice seems to be small. The pizza my aunt ordered was the Chicken Supreme pizza in regular size. The toppings in the Chicken Supreme includes chicken ham, spicy chicken chunks, roasted chicken chunks, onions, capsicums and mushrooms. Surprisingly, even though the pizza looked like it shrunk, the restaurant wasn't so selfish with the toppings. They're generous with the toppings and each bite was full of toppings. The tomato sauce and cheese were also generous too. Overall, the Chicken Supreme was utterly delicious but if you're sharing with more than three, get the larger one. The pizza was also served hot and delicious. The best thing about Pizza Hut's new policy is that when the HOT sticker does not show 'hot' on the pizza box, your next pizza's free. Oddly enough, the tortilla chips came in this small box meant for the other Pizza Hut appetiser, Chicken Diplets. Usually, appetisers are placed in a small box much like this but has a generic Pizza Hut logo. 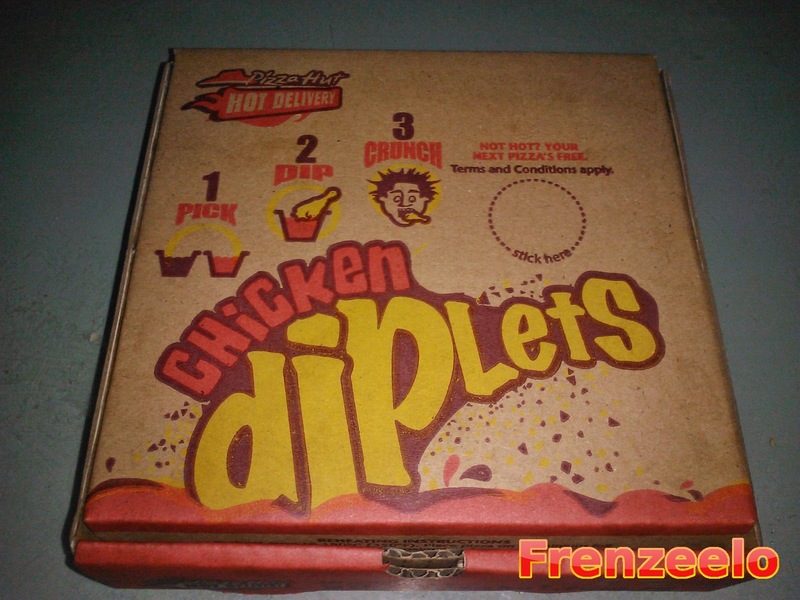 I like this packaging and I would definitely like to try the Chicken Diplets after seeing this interesting graphic. Perhaps they run out of those generic boxes or maybe they are subliminally advertising this to me? Anyway, definitely I would like to try these Chicken Diplets. Out of all, Pizza Hut delivery is a great way to prevent the problems of spending transport money to buy outside food and save the hassles of cooking at home. All you have to do is check the menu online, pick up the phone or order online, wait and pay for your pizza and delivery charges. It's convenient and awesome. Just don't order it too often unless you want your belt buckle to break open when you walk along the pavements. If you wanna save, you can order Canadian Pizza where you buy 1 pizza and get another for free. Or if you want faster service, you can order Domino's Pizza where they'll deliver to you in 30 min or less. Pizza Hut also has dine in restaurants located islandwide. Pizza Hut Delivery is HALAL certified. Pizza really looks so yummy, I wish I could try that pizza! Yup, it sure is! It's called the Chicken Supreme. Not so sure suji. How about calling Pizza Hut's hotline? 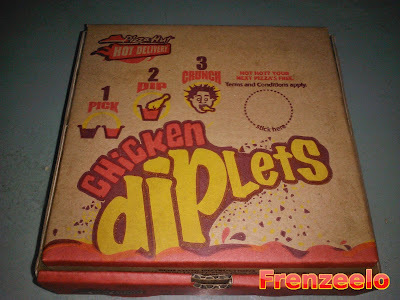 Never tried the chicken diplets before. Looks nice though.